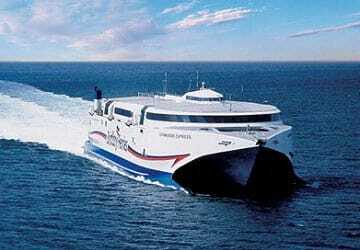 Normandie Express is a high-speed catamaran capable of carrying passengers, vehicles and freight at a maximum speed of 42 Knots (about 48 miles per hour). 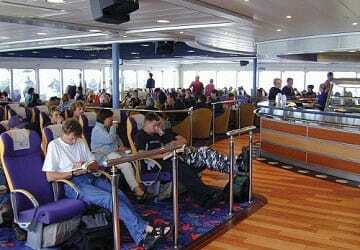 On board you have space to relax and freedom to walk around this High Speed Ferry. For the short channel crossing you'll find comfortable seating, bars, café and a boutique making it an enjoyable experience. There are no cabins or reserved seats on this ship. Complimentary reclining seats are however included in your ticket offering a comfortable and relaxing environment with each seat having a fold-up tray. 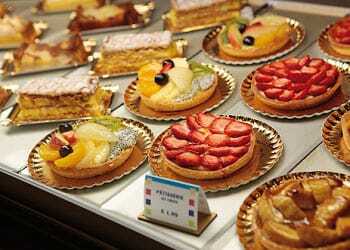 On board the Normandie Express you will find two bars and a café, serving sandwiches, salads, pastries, snacks, cold drinks, teas and coffees. There is comfortable seating and tables in an area dedicated to the café. 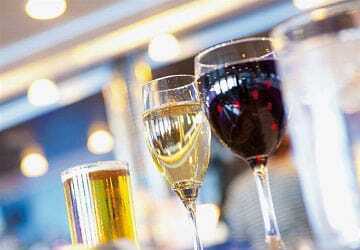 The bars serve a range of drinks from fine French wines to continental lagers and cocktails. 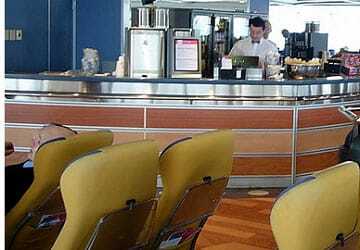 The bars and café offer ample seating with great views, and are the perfect place in which to relax and enjoy time with your friends and fellow passengers as you speed across the channel. 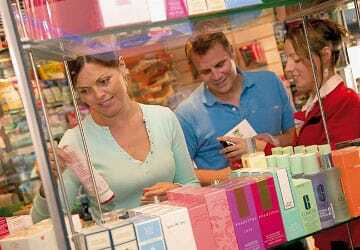 Perfect for gifts, souvenirs, or just a treat for yourself, the shop offers a range of spirits, wine, tobacco, perfumes and cosmetics, leather goods, confectionery, toys, fashion, decoration, souvenirs, newspapers, games, cameras, sunglasses, jewellery and much more! All are at great prices, and certainly worth a browse. Purchases made on board may be paid for in Euros or Sterling. Payment can be made in cash, by credit or debit card, or by cheque. Prices are shown in both currencies and you can combine different payment methods. Additional facilities include an open sun deck, slot machines, baby changing room, tourist information and a Bureau de Change. The Normandie Express features a children's play area. 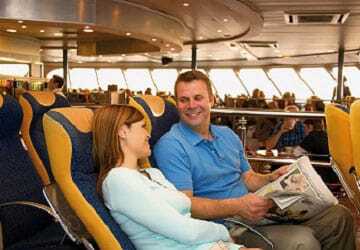 Passengers with limited mobility will find the facilities and access more challenging to negotiate because of the size and design of this vessel. Please Note: Whilst we have taken great care in making our Normandie Express guide as accurate as possible, onboard facilities, services and entertainment may vary depending on the date and time of year that you travel, facilities mentioned may change without notification and ferry companies reserve the right to operate vessels other than those mentioned at time of booking without prior notification. Very relaxing trip. Could be a bit cheaper, but overall very good. Our first ferry crossing with a car and we were very impressed! Embarking and disembarking at both ports was punctual, quick and efficient - we were amazed at how speedily the guys got all the cars loaded on! Once on-board the facilities and staff were top notch. All round a great experience! Fast check in and helpfull personnel. "My Experience of the Service"
I was pleased. My booking was handled well and the vessel itself was modern, clean and departed on time from both Portsmouth and Cherbourg, completing the journeys very accurately in the times predicted. Due to a mechanical failure with my car I was forced to postpone my return journey twice, because the repair took longer than initially thought. The booking changes were expensive, but I was given a concessionary rate for the second postponement because of the nature of the reason for the change, for which I was very grateful. i would have no hesitation in using the service again as the need arises. Good experience. Punctual outward & inward crossings. Cars packed very tight but generally acceptable arrangements. Rather limited choice of snacks & sandwiches though reasonably priced. "Just as it says it is!" I was travelling for the first time with my young son in an unfamiliar place and have to say that the ferry crossing was the least stressful part of the whole trip. The service was exactly as it sells itself to be; uncomplicated and efficient. I would definitely travel this crossing and this provider in preference to others now. Our crossing was fantastic - great service, great staff, great ferry! If there was anything that could be improved, I would suggest more facilities for younger children as they are often difficult to entertain! I appreciate there is little space on board the ferry so this request might be challenging! "A pleasant way to start your holiday"
Highly recommended, very pleasant and smiling staff. One thing I would improve is the internet which I've never actually managed to get on board. "Simple and efficient service "
A very good convenient service. A quick enjoyable crossing. I enjoyed a quick jump from Cherbourg to Portsmouth this July. The boarding was quick and simple, the terminal was very quiet and to be honest there isn't much there, but thats not an issue as all you need is a quick coffee if you are early. The fast ferry was great, nice sandwich, film for the kids and only 3 hours. 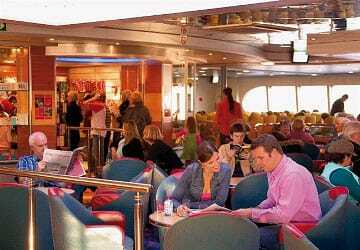 We sailed on Brittany Ferries Normandie Express crossing from Portsmouth to Cherbourg and had a great experience. All the staff were really helpful, the crossing extremely fast and we would thoroughly recommend. We were very happy with the whole process. Non-formal and uncomplicated as always! It was all very easy and efficient. From booking online - to driving off in Cherbourg. Food was OK but I would have preferred a bit more choice. However, we weren't on the ferry very long so it was no big deal.